Unlike other Naruto Special/OVA episodes that feel kind of slow, this one moves at a nice pace. The Cross Roads managed to keep me interested all the way through and I was very happy to see that it's pretty much like a normal episode... Except for the art. This one is not animated like your typical Naruto episode. It has somewhat of a 3D-ish style to it. Although I'm usually not that big of a fan of this style, I thought it looked decent and it wasn't much of a problem when you got into the action. I had only a few issues with The Cross Roads. For example, it had a cheap way of getting the story where it needed to go, but I guess it's unfair to expect much else from a 26 minute episode. Also, there were a couple of things that did not make any sense. All in all, I think this episode was pretty enjoyable. More so than many fillers in the anime itself. 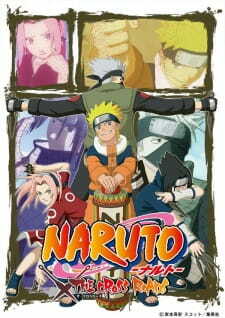 As a celebration for the 10th year of Naruto's serialization, the OVA under the title of “Naruto: The Cross Roads” was released on the 12th October 2009 that offers something different as far as the Naruto releases go. This time around, with a flashback centered story all in a style that settles between the classic 2D and 3D animations, and it actually doesn't feel as bad as it sounds, but it was never about animation alone, unless you're just like the brats dropping their jaws whenever they spot colors, that's the power of visual, and it's easily deceiving. Before diving in into the story dissection, I'd really like to warn you on the spoiler heaviness you'll encounter, so,in case you've already passed the first 300 episodes of Naruto Shippuden, this would be as normal as a review gets, major spoilers ahead, if you'd like to avoid them, please skip the story analysis and move on to later parts. The premise of the story is one short flashback of Sasuke's from the point of the story where he was a member of the Akatsuki, one that goes back in time to the much simpler times when he was still part of team 7, somewhere after the events of the Hidden mist arc and before the Chunnin exams. A lame classic plot point had Sasuke of course taken hostage by the baddies in order for Sasuke and Naruto to save her whilst Kakashi is absent. It was all fast-paced action that Orochimaru orchestrated in order to “test Sasuke and tease later events like him switching sides. It really felt like a painful excuse to milk an OVA out of all the build-up that lead to him joining the Akatsuki, with few references to Itachi and the Uchiha clan. CGI, and before you face the other side and start running away, it actually looked decent, not the best, One Piece Mugiwara Chase 3D had me pin it as one if not the best 3D adaptation for an already long-running serialization and Naruto tried holding on to the safe zone and was almost there. It all looked more like a game cutscene rather than a normal animated episode, keeping it as close to 2D as possible differently helped lower the strangeness of it a bit. The water mechanics were cool, the smoke animation as well. However the fights despite being a lot more fluid and organic they still felt like a stranger and took away a lot of what made Naruto fights look cool. I really appreciate the nostalgic soundtracks and sound effects. The voice acting was above average, nothing too jaw-dropping. A lot of room for improvement is different there, it seems so cheap for a milestone anniversary to be honest. Disappointed, Sasuke couldn't be less out of character here, you'd figure they would give her a moment of shine in such an important OVA like this one, she still played the bait role after all and contributed in nothing good. The focused bad guys had terrible character designs and even worse ideology, they looked way too weak for the struggles they put team 7 at. Generally, very forgettable and interesting to say the least. The main spotlight here was enjoying the hand to hand combat with minimal ninjutsu (remember when it was all about that?). Probably the coolest thing was the references to future arcs, even the ones in Shippuden. Such a waste, it had literally no re-watch value whatsoever. I would strongly suggest avoiding this until you've watched through the first 300 episodes of Naruto Shippuden. Despite it being set on the timeline of the original series, it does deal with topics from future arcs, even going as far as showing massive spoiler clips from mid-Shippuden.